1.7 miles, blue blazes, more difficult hiking. Located at Parker Dam State Park. Explore a wilderness valley devastated by a tornado in 1985, then salvage-logged in 1986. The varying habitats caused by the blowdown, the logging roads, gas well sites and beaver dams give the hiker many opportunities to view diverse wildlife. 2.3 Mi. – blue blazes, easiest hiking. This trail is located at Parker Dam State Park. It is a loop that follows and old railroad grads. Early mornings is the best time to hike this trail, if you are interested in active beaver dams. 2 Mi. – This trail is located near the Shower's Field in DuBois. It travels through the big beaver meadow an important corridor for the Seneca Indians. There is a place for your four legged friends to play and you can easily access the DuBois Mall and nearby restaurants. 1.6 miles, blue blazes, easiest hiking. Trail located at Parker Dam State Park. This trail is a walk down memory lane to the days of the Civilian Conservation Corps (CCC). This was the road used daily for travel between the residential CCC camp (now the Organized Group Tenting Area) and the work site at the dam. Now the road serves as a trail, making its way through pleasant pine plantations, traversing from Tyler Road to a point on Mud Run Road. A connector trail leads to Laurel Run Trail. 8.6 Mi. - There are 12 named and color coded trails on the west side of Lake Drive on the Curwensville Lake Recreation and surrounding game land property. These trails range in difficulty and length. 6.6 Mi. - There are 9 named and color coded trails on the east side of Lake Drive on the Curwensville Lake Recreation and surrounding game land property. These trails range in difficulty and length. 11 Mi. – There are several places to access this spot in Clearfield, Curwensville and Grampian. The Clearfield to Curwensville stretch is relatively flat and runs along the West Branch Susquehanna River. The Curwensville to Grampian has more of a grade and is decorated with nature's scenery. 18 MI. - There are several access points along this trail, the Dimeling Bridge and Kellytown (Near Bloody Knox Cabin) are the two best. This trail runs along the scenic Clearfield Creek. Be sure to stay alert for ATV's as you hike this trail. 11 Mi. – There are several access points along this trail. The Far East and west ends of the trail are in rough condition but are easily navigable to hikers, bikers and cross country skiers. 1 mile, yellow blazes, more difficult hiking. Located at Parker Dam State Park. Long used by fishermen and more recently by loggers, this trail starts near the campground bridge, follows Laurel Run and winds through the tornado blowdown area. 0.5 mile, orange blazes, easiest hiking. Located at Parker Dam State Park. By the trailhead is an authentic reproduction of a log slide, used in the 1870s to haul logs out of the forest. A display shows other logging tools. Look along the trail for places where the Civilian Conservation Corps cut stone in the 1930s to build Parker Dam. The trail connects with Stumpfield Trail via a pipeline and is part of the Quehanna Trail, which is blazed in orange. Go past DOC Boot Camp for several miles to Game Commission parking lot on left. From here you can run either left or right. A very intense run, much steeper than it looks, on pavement that is kept very clean in the winter. Road is well marked with mile markers, lots of wild game can be seen here, deer and elk frequent the area. 73 Mi. - Orange blazes, most difficult hiking. This trail travels from the park through the Quehanna Wild Area. 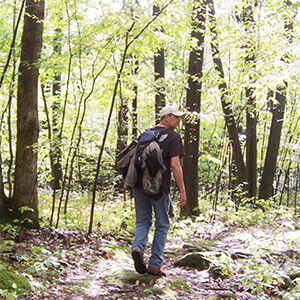 The backpack trail loops range from one to seven days. 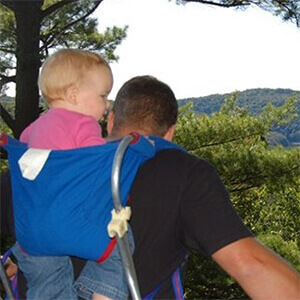 Only experienced hikers should use these wilderness trails. The main trail is blazed in orange. Connector trails are blazed in yellow. This trail runs through some of the most wild and beautiful country Pennsylvania has to offer. You will pass some of the most scenic features in the region while hiking this trail. It is likely you will share the trail with the majestic Pennsylvania Elk. 1.4 miles, blue blazes, easiest hiking. Located at Parker Dam State Park. This trail winds through hardwood trees. It connects Souders Trail with Mud Run Road. 1.6 miles, blue blazes and orange diamonds, easiest hiking. Located at Parker Dam State Park. The trail starts on Beaver Dam Trail and connects with Moose Grade Road. Popular with snowmobilers, hunters and cross-country skiers, Snow Trail offers a pleasant hike in the wilderness. 18.6 Mi. – Access this trail at the Clearfield County/Center County line off the Kylertown exit off interstate 80. This trail is smooth in places and has rough gravel in others. You will cross a viaduct bridge and the scenery includes amazing vistas and the trail runs along the old Beech Creek Railroad. Beware of motorized vehicles. .75 Mi. – You can access this trail at Parker Dam State Park. It is a scenic loop thatfeatures Laurel Run Creek. This trail connects to the Skunk Trail. 3.5 miles, orange or blue blazes and blue diamonds, more difficult hiking Start beyond Montgomery Field on the Fairview Road and follow the old railroad spur used from 1910 to 1913 to log the area. 3 Mi. – A designated route on Slab Run Road and spurs from the gate off Game Lands (T402) to the dead end. 1.3 Mi. – A designated route along the main administrative road from the gate off of SR 1009 to the dead end. 2.5 Mi. – A designated route from gate to gate on Curry Run Road and the dead end spur on Beech Run Road. 8 Mi. – A designated route from the main entrance off of South Continental Divide Road across South Bennetts Branch to the Winterburn gate and to the Sabula gate including the spur road to the Home Camp Road gate. 1.7 and 1.5 Mi. – There are two trails on this game land. The 1.7 Mi. route is a designated route on Roberts Run Road west from the main parking lot off of Chestnut Ridge Road to the dead end at Trout Run Road. The 1.5 Mi. route is a designated route from the main parking lot off Chestnut Ridge Road to the dead end at the south gate. 10 Mi. – All main road and spurs on this Game Lands are considered designated routes and are posted accordingly. 0.5 mile, yellow blazes, easiest hiking. Located at Parker Dam State Park. Begin at the campground amphitheater and traverse a meadow that was once a forest of pine and hemlock. Look for large stumps left from logging at the turn of the 20th century. Stunted trees and thick shrubs are evidence of repeated wildfires that destroyed topsoil and slowed forest regrowth. This trail connects with Logslide Trail via a pipeline. 1.4 Mi. - Blue blazes, more difficult hiking. This is located at Parker Dam State Park. This trail follows logging roads along the top of Sullivan Mountain, offering scenic overlooks of Moose Run Valley. Sullivan Ridge Trail connects Snow Trail with Abbot Hollow Trail. This trail is not for cross-country skiing. 0.5 mile, blue blazes, easiest hiking. Located at Parker Dam State Park. This logging road connects Sullivan Ridge Trail with the cabin area. It offers a panoramic view of the tornado damage in Abbot Hollow. 1 mile, yellow blazes, more difficult hiking. Located at Parker Dam State Park. On May 31, 1985, one of Pennsylvania's largest and strongest tornadoes roared through the park and destroyed the towering forest of ash, oak, beech and sugar maple trees. The Trail of New Giants cuts through the blowdown and the 250-acre Windstorm Preserve. Walk the trail and see the forest regenerating. A spur trail leads to a beautiful vista of the park and surrounding forest. 4.5 Mi. - Located off interstate 80 exit 97, this trail was formerly part of the Buffalo, Rochester and Pittsburgh rail line. Harvey Run and Wolf Run meander along this trail and it is near state game lands #77 which you can explore at your leisure as well. 588 acres – Explore the leafy terrain in this natural area from the parking area to the protected watershed areas.